Discounted registration for the National Bike Summit, the country's premier gathering of cycling advocates. 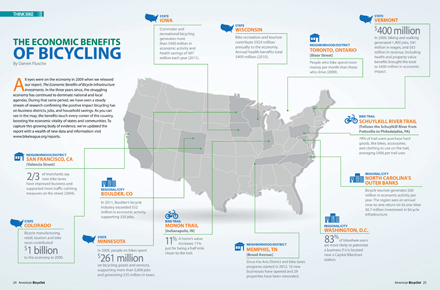 League member organizations are invited to participate as Bicycle Friendly America local reviewers for community, business, state, and university applications. Member Advocacy Organizations may also utilize our Phone2Action advocacy platform to engage their members in support of local biking and walking legislation. Your membership also supports stronger bicycling advocacy across the country, by powering the League's multi-faceted advocacy work. Want your organization to have a say in the League's federal platform? Consider joining our National Leadership Circle! The National Leadership Circle is a coalition of state and local bicycling and walking advocacy organizations involved in supporting League federal advocacy, setting League federal policy, and helping us build capacity in local and statewide advocacy organizations through the Active Transportation Leadership Institute. 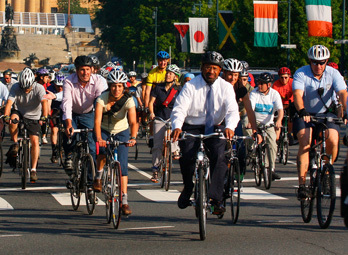 Together, we're carrying the legacy of the Alliance for Biking & Walking, forward. Choose members of the Bike Walk Action Advisory Committee -which talks monthly to discuss and advise league staff on federal policy issues and how they effect state and local advocacy. Aid all local biking and walking advocacy organizations through out the U.S. through our Active Transportation Leadership Institute. Together, we're producing the Biking and Walking Benchmarking Report, Hosting and moderating the BikeLeague Hub, and producing the annual Leadership Retreat, along with other regional meetings. Join our National Leadership Circle with an additional pledge of roughly 0.1% of your organizational operating revenue, with a minimum payment of $50.